2 of 3: Globodera pallida eggs released from cyst. Each cyst contains 300-400 eggs. 3 of 3: Globodera pallida feeding on potato root (stained with acid-fuchsin). The pale cyst nematode (PCN), Globodera pallida, a serious invasive pest of potato, was found in Idaho in 2006, and a major eradication effort has been underway for several years. Left uncontrolled, PCN can cause up to 80 percent yield loss, and worldwide this pest accounts for more than 12 percent of yield losses in potato. 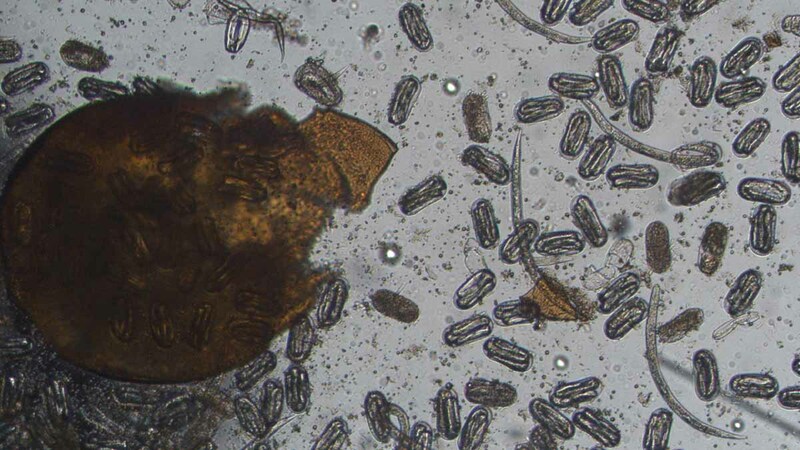 PCN, like other cyst nematodes, can survive in soil for long periods, as eggs in the dead bodies of female nematodes (which are called “cysts”). Even in the absence of the potato host crop, viable cysts may remain in field soil for years. 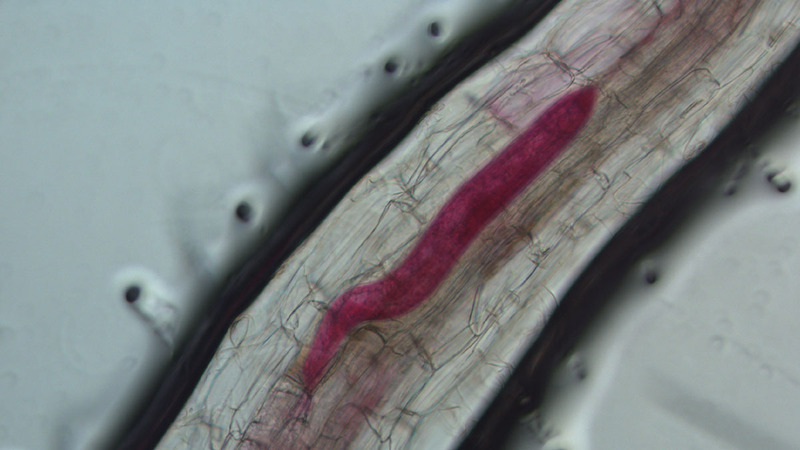 Eradication of pale cyst nematode relies on several strategies, including quarantines of fields where the nematode has been found, and fumigation with methyl bromide and other nematicides. These activities are being done by USDA-APHIS (U.S. Department of Agriculture, Animal and Plant Health Inspection Service). The UI PCN Project provides support to these efforts, by conducting viability bioassays of nematode cysts that are recovered from fumigated fields. Worldwide, use of the fumigant methyl bromide is being phased out, and this product may not be available in the future. For those reasons, development of effective and environmentally friendly eradication strategies for PCN are a high priority. In collaboration with researchers from USDAARS as well as colleagues at the University of Idaho, we are investigating a number of novel alternative eradication strategies. These include the use of fungal biological control agents, non-host nematode trap crops, nematicidal rapeseed meal and combinations of these strategies. This research is being conducted with the generous support of the Idaho Potato Commission, Idaho Agricultural Experiment Station, Idaho State Department of Agriculture, National Potato Council and the United States Department of Agriculture.